It's long been clear that doctors in the USA have been far too ready to prescribe opiates to patients and that they are largely responsible for the crisis of opiate addiction in which we find ourselves. 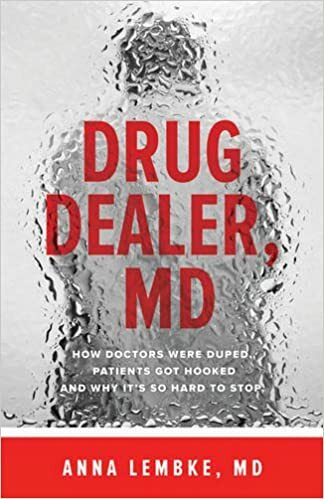 Lembke's excellent book Drug Dealer, MD explains how this came about. It's a short book, concisely written, giving plenty of examples of patients' stories while at the same time showing trends in policy and national practice. The book has 10 chapters covering many aspects of the story. One of the most interesting is the change in attitude towards pain. Pain used to be viewed by doctors in a positive light, as a warning of problems and as an opportunity for growth. Now we view pain as always intolerable and as a cause of trauma. With the availability of pain killers, reasons were found to use them. This is part of a larger trend to medicalize many of life's problems and prescribe medication as the solution, which has been good for the pharmaceutical industry but not necessarily so good for people's health and happiness. In another chapter, we learn how opioids were promoted as a solution to pain, and their dangers were completely neglected. Referring to the book Pain Killer, Lembke explains how Dr Russel Portenoy was a leader in the 1980s of those promoting opioids, making claims that they were safe and effective to use in the treatment of chronic pain. It isn't surprising if there are one or two doctors who are overenthusiastic about medication. What is shocking is how the medical establishment bought into this myth about opioids and started their wide-spread use. Lembke spends several chapters explaining how drug-seeking patients now get drugs. They are very persistent, and sometimes they engage in lying and exaggeration in order to feed their habits. There are some checks on patients to stop them from abusing the system. But the system is very much set up to push patients through quickly, and they don't get enough individual attention. Insurance companies, in their usual display of baffling policies, are unwilling for fund treatment that would help to actually end the addictions and problems, but are willing to continue to fund treatment that prolongs the problem. Lembke points out that even though the crisis of opioid addiction has been recognized and some policy changes have been put into effect, the problem continues, even getting worse. She does not spend much time on how we can now solve the problem, given that it is so entrenched, but she is clear that reforms need to be major.